Definition at line 50 of file llfloaterproperties.h. Definition at line 95 of file llfloaterproperties.h. Definition at line 141 of file llfloaterproperties.cpp. 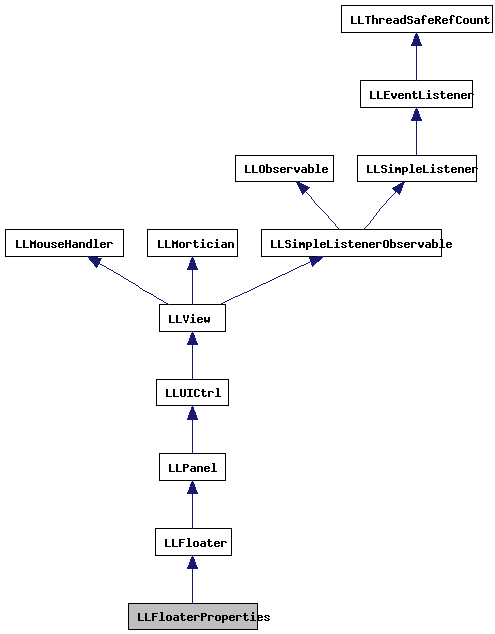 References LLInventoryModel::addObserver(), LLUICtrlFactory::buildFloater(), LLPanel::childSetAction(), LLPanel::childSetCommitCallback(), LLPanel::childSetPrevalidate(), gInventory, gPropertiesObserver, gUICtrlFactory, mItemID, mObjectID, onClickCreator(), onClickOwner(), onCommitDescription(), onCommitName(), onCommitPermissions(), onCommitSaleInfo(), onCommitSaleType(), LLLineEditor::prevalidatePrintableNotPipe(), refresh(), and sInstances. Definition at line 189 of file llfloaterproperties.cpp. References mItemID, mObjectID, and sInstances. Definition at line 917 of file llfloaterproperties.cpp. Definition at line 65 of file llfloaterproperties.h. Definition at line 130 of file llfloaterproperties.cpp. Referenced by LLPropertiesObserver::changed(), and dialog_refresh_all(). Definition at line 250 of file llfloaterproperties.cpp. Definition at line 95 of file llfloaterproperties.cpp. Referenced by closeByID(), LLPanelInventory::inventoryChanged(), and show(). Definition at line 898 of file llfloaterproperties.cpp. References LLViewerObjectList::findObject(), LLViewerObject::getInventoryObject(), LLInventoryModel::getItem(), gInventory, gObjectList, LLUUID::isNull(), mItemID, mObjectID, and NULL. Referenced by refresh(), and updateSaleInfo(). Definition at line 572 of file llfloaterproperties.cpp. References LLInventoryItem::getCreatorUUID(), LLUUID::isNull(), and LLFloaterAvatarInfo::showFromObject(). Definition at line 585 of file llfloaterproperties.cpp. References LLPermissions::getGroup(), LLPermissions::getOwner(), LLInventoryItem::getPermissions(), LLPermissions::isGroupOwned(), LLUUID::isNull(), LLFloaterAvatarInfo::showFromObject(), and LLFloaterGroupInfo::showFromUUID(). Definition at line 647 of file llfloaterproperties.cpp. References LLAgent::allowOperation(), FALSE, LLViewerObjectList::findObject(), gAgent, LLInventoryItem::getDescription(), LLUICtrlFactory::getLineEditorByName(), LLInventoryItem::getPermissions(), LLLineEditor::getText(), gInventory, gObjectList, GP_OBJECT_MANIPULATE, LLInventoryModel::notifyObservers(), PERM_MODIFY, TASK_INVENTORY_ITEM_KEY, LLViewerObject::updateInventory(), and LLInventoryModel::updateItem(). Definition at line 605 of file llfloaterproperties.cpp. References LLAgent::allowOperation(), FALSE, LLViewerObjectList::findObject(), gAgent, LLUICtrlFactory::getLineEditorByName(), LLInventoryObject::getName(), LLInventoryItem::getPermissions(), LLLineEditor::getText(), gInventory, gObjectList, GP_OBJECT_MANIPULATE, LLInventoryModel::notifyObservers(), PERM_MODIFY, TASK_INVENTORY_ITEM_KEY, LLViewerObject::updateInventory(), and LLInventoryModel::updateItem(). Definition at line 687 of file llfloaterproperties.cpp. References LLAssetType::AT_OBJECT, FALSE, LLViewerObjectList::findObject(), gAgent, LLCheckBoxCtrl::get(), LLUICtrlFactory::getCheckBoxByName(), LLAgent::getGroupID(), LLAgent::getID(), LLInventoryItem::getPermissions(), gInventory, gObjectList, LLInventoryItem::II_FLAGS_OBJECT_PERM_OVERWRITE_EVERYONE, LLInventoryItem::II_FLAGS_OBJECT_PERM_OVERWRITE_GROUP, LLInventoryItem::II_FLAGS_OBJECT_SLAM_PERM, LLViewerInventoryItem::isComplete(), LLInventoryModel::notifyObservers(), PERM_COPY, PERM_MODIFY, PERM_MOVE, PERM_TRANSFER, TASK_INVENTORY_ITEM_KEY, LLViewerObject::updateInventory(), and LLInventoryModel::updateItem(). Definition at line 786 of file llfloaterproperties.cpp. Definition at line 795 of file llfloaterproperties.cpp. Definition at line 199 of file llfloaterproperties.cpp. References LLPanel::childSetEnabled(), LLPanel::childSetVisible(), findItem(), mDirty, refreshFromItem(), t, and TRUE. Referenced by draw(), LLFloaterProperties(), show(), and updateSaleInfo(). Definition at line 262 of file llfloaterproperties.cpp. References LLAgent::allowOperation(), LLAssetType::AT_OBJECT, LLPanel::childGetText(), LLPanel::childSetEnabled(), LLPanel::childSetText(), LLPanel::childSetValue(), LLPanel::childSetVisible(), DB_FIRST_NAME_BUF_SIZE, DB_GROUP_NAME_BUF_SIZE, DB_LAST_NAME_BUF_SIZE, FALSE, LLViewerObjectList::findObject(), gAgent, gCacheName, LLControlGroup::getBOOL(), LLUICtrlFactory::getCheckBoxByName(), LLInventoryItem::getCreationDate(), LLInventoryItem::getCreatorUUID(), LLInventoryItem::getDescription(), LLInventoryItem::getFlags(), LLPermissions::getGroup(), LLCacheName::getGroupName(), LLPermissions::getMaskBase(), LLPermissions::getMaskEveryone(), LLPermissions::getMaskGroup(), LLPermissions::getMaskNextOwner(), LLPermissions::getMaskOwner(), LLCacheName::getName(), LLInventoryObject::getName(), LLPermissions::getOwner(), LLInventoryItem::getPermissions(), LLUICtrlFactory::getRadioGroupByName(), LLAgent::getRegion(), LLInventoryItem::getSaleInfo(), LLSaleInfo::getSalePrice(), LLSaleInfo::getSaleType(), LLInventoryObject::getType(), gObjectList, GP_OBJECT_MANIPULATE, GP_OBJECT_SET_SALE, gSavedSettings, i, LLInventoryItem::II_FLAGS_OBJECT_PERM_OVERWRITE_EVERYONE, LLInventoryItem::II_FLAGS_OBJECT_PERM_OVERWRITE_GROUP, LLInventoryItem::II_FLAGS_OBJECT_SLAM_PERM, LLSaleInfo::isForSale(), LLPermissions::isGroupOwned(), LLUUID::isNull(), LLPermissions::isOwned(), llformat(), mask_to_string(), mObjectID, LLUUID::notNull(), NULL, PERM_COPY, PERM_MODIFY, PERM_MOVE, PERM_OWNER, PERM_TRANSFER, LLViewerObject::permOwnerModify(), S32, LLCheckBoxCtrl::set(), LLRadioGroup::setSelectedIndex(), LLCheckBoxCtrl::setTentative(), and TRUE. 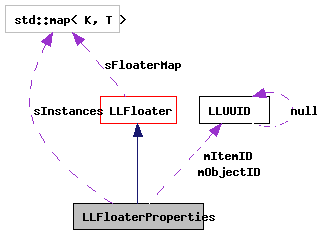 Definition at line 111 of file llfloaterproperties.cpp. References find(), LLFloater::getFloaterHost(), LLFloater::getHost(), LLFloater::open(), refresh(), and TRUE. Referenced by LLTaskInvFVBridge::showProperties(), and LLShowProps::showProperties(). Definition at line 803 of file llfloaterproperties.cpp. References LLAgent::allowOperation(), LLPanel::childGetValue(), LLPanel::childSetValue(), FALSE, findItem(), LLViewerObjectList::findObject(), LLSaleInfo::FS_CONTENTS, LLSaleInfo::FS_COPY, LLSaleInfo::FS_NOT, LLSaleInfo::FS_ORIGINAL, gAgent, LLUICtrlFactory::getLineEditorByName(), LLInventoryItem::getPermissions(), LLUICtrlFactory::getRadioGroupByName(), LLInventoryItem::getSaleInfo(), LLRadioGroup::getSelectedIndex(), LLLineEditor::getText(), gInventory, gObjectList, GP_OBJECT_SET_SALE, LLViewerInventoryItem::isComplete(), LLUUID::isNull(), mObjectID, LLInventoryModel::notifyObservers(), PERM_COPY, PERM_TRANSFER, refresh(), S32, TASK_INVENTORY_ITEM_KEY, LLViewerObject::updateInventory(), and LLInventoryModel::updateItem(). Definition at line 93 of file llfloaterproperties.h. Referenced by dirty(), draw(), and refresh(). Definition at line 86 of file llfloaterproperties.h. Referenced by findItem(), LLFloaterProperties(), and ~LLFloaterProperties(). Definition at line 91 of file llfloaterproperties.h. Referenced by findItem(), LLFloaterProperties(), refreshFromItem(), updateSaleInfo(), and ~LLFloaterProperties(). Definition at line 96 of file llfloaterproperties.h. Referenced by dirtyAll(), find(), LLFloaterProperties(), and ~LLFloaterProperties().